This new Vitamin C Skin Serum with 25% Peptide C Complex from iLab, is the very latest in anti-aging skin care. Recent scientific research has shown that vitamin C is a potent antioxidant that is capable of preventing and even reversing the effects of aging on human skin. It is for this reason that we use vitamin C as a key ingredient in our anti-aging formulations. If topically applied, a high-dose of vitamin C serum would also help prevent and treat dry skin problems. 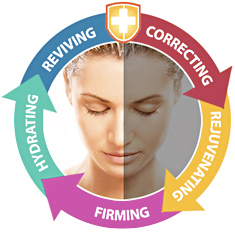 Advanced C-25 is designed to counteract time, the environment, and the forces that are harmful to your complexion. At the same time, it protects from future damage by promoting cell renewal, boosting collagen production and providing antioxidant protection. Hexapep C-Silk is an exclusive Multi-Vitamin Facial Treatment with Argireline. It contains an essential amount of Vitamin C, just the right concentration of Vitamins A and E, also beneficial minerals, and extra pure essential oils. Hexapep C-Silk helps the skin regain tone, moisture, silkiness and radiance. It provides a smoothing, antioxidant, brightening and protective treatment for all types of non-sensitive environmentally damaged skin starting to show signs of aging. When used prior to makeup, it helps to form a breathable moisture seal and helps to achieve a smooth and even application of makeup.